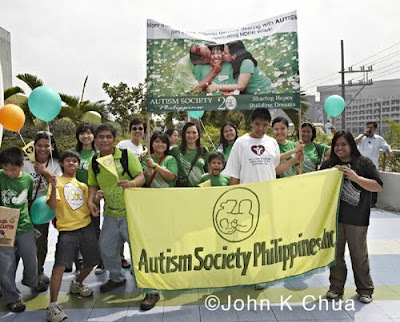 ASP Cavite Chapters joined DSAPI’s “Stand UP for DOWN,” Down Syndrome Association of the Philippines’ Happy Walk last February 21, at SM North EDSA. The event commemorates the 8th National Down Syndrome Consciousness Month. ASP Bacoor Chapter President, Ms. Jan Peña, was joined by her three young advocates, including son Muneer, CWA representative. Muneer held ASP’s Banner during the walk. Around 2,000 children/adults with Downs, parents, friends, volunteers and supporters came to register as early as 8 am. After the Thanksgiving Mass at The Block of SM North EDSA, the Happy Walk proper started at 10am. The Guardian Angels of Children with diff-ability, Mr. Hans Sy, President of SM Prime Holdings; Eng. Bien Mateo, Chair of SM Committee on Disability Affairs; Mr. John Chua, Certified Autism Angel and ASP Chair Emeritus, Dang Koe came in support of the event. A brief program followed with simultaneous activities such as hip-hop dancing (Happy Dance); Amazing Walk (patterned after Amazing Race); different activity booths such as face painting, glitter tattoo, balloon making and a Photo and Art Exhibits, plus Therapy Sessions. ASP, together with DSAPI and other PWD groups, will always STAND UP for children with diff-abilities. Joining forces means showing others we aim for more understanding and compassion. These children are no different than you and I. They also part of the community and deserve to enjoy the same rights as we do; for after all, we are all part of God’s creation. This is a very influential post. I am glad that advocates are coming together to raise awareness about Down syndrome! How long was this walk?